The Khaaneph have come out of the blue (or light brown, as it were) both literally and figuratively – Kiith Khaaneph raid the Gaalsien for ships and technology, and Gearbox / Blackbird were both keeping the DLC under wraps right up until release. Not that the latter is a bad thing – do what you will guys, as long as you keep bringing us more rad Homeworld content! Missile System – The Khaaneph Carrier can shunt power to increase the ammunition and reload speed of its targeted missile weapon. Missiles provide excellent early-game defense and late-game offense. Mobility Support – A new shunting system that allows Carriers and Production Cruisers to speed up nearby allies. Take a look at that carrier! It looks like the Tuscan Raiders met up with the Turanic Raiders and designed the ultimate desert hovercraft. I’m continually impressed with the art crew at Blackbird Interactive (that’s why I interviewed two of them, Brennan and Stephen), because they’re designing completely new ships that look totally unique on their own, but feel perfectly part of the Homeworld universe. An art fan of BBI, I am. Oooh right, the carrier does other things besides look amazing. It has a missile system that’s similar to the one in the single player campaign, except with a shorter cooldown, much shorter range and less damage. Using your carrier power points you can decrease the reload time of your missiles, adding a strategic element to their usage. The missile range is about ~4 carrier-lengths, so it’s super useful as defense early game if you’re opening with a resourcing build, and tons of fun if you like to run your carrier around offensively, especially against enemy resource ops (my personal favorite target). The carrier also features the ability to increase the speed of nearby units, a useful ability in any RTS game. 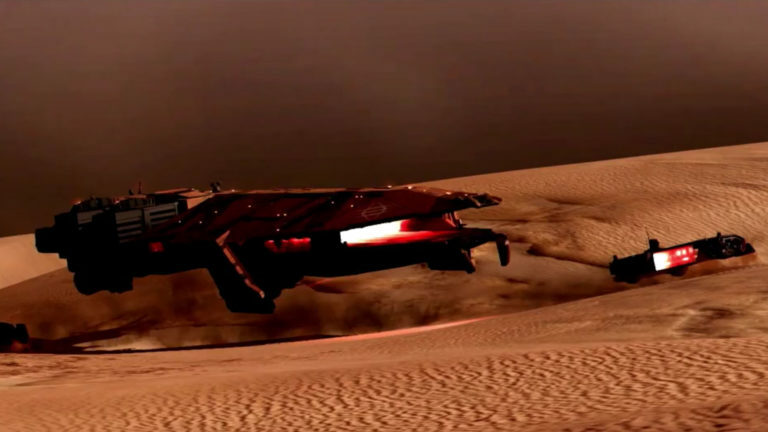 Blast Drones – Khaaneph Baserunners can deploy a limited number of Blast Drones, fast unmanned skimmers that rush towards enemies and detonate a powerful explosive. Smoke Wall – Khaaneph Baserunners can deploy a series of smoke grenades in their wake, allowing a mobile baserunner to create a wall of sight-blocking smoke. The blast drone is just what you need for those hard-to-reach itches: railguns, sandskimmer swarms, and, not to be forgotten: enemy resourcers! Simply select your baserunner, hit the blast drone hotkey, and ~15 seconds later your itch is scratched. Very satisfying. Not everything needs to go boom, though: the smoke wall is superb for blocking railgun and honorguard cruiser line of site, and for obscuring a forward scout’s vision vs an artillery bombardment. While I’m still a fan of the Coalition baserunner abilities, the Khaaneph abilities are excellent. Mobility Support – Using the Carrier’s Mobility Support system, the production cruiser can boost the speed of nearby allied units. As I mentioned previously, unit speed is powerful in any RTS, and ‘punching it’ with the Khaaneph production cruiser is excellent for both escaping and for running down, say, a pack of LAV’s that’s harassing your resource op – or for getting your sandskimmers out while harassing theirs! The Khaaneph take the lead over even the Gaalsien at hit and run tactics with not one but two ground-based speed boosts. As I mentioned in the Soban Fleet Pack DLC coverage, I’m a huge fan of DLC in general as long as the original game is up to par. DoK was most definitely up to par, so the Soban and Khaaneph DLC’s are both very welcome additions. I’ve been impressed with the multiplayer balance and variety in DoK, and that attention to detail has been applied to both the Soban and Khaaneph fleet packs – thanks Rory and team! Now that there’s an even 4 races in DoK (as shown above, brought to us courtesy of the latest patch) I’m wondering if the next DLC will add more singleplayer content? I definitely hope so! Don’t forget to catch our live stream to watch myself, StompyGirl, and Sajuuk stream Deserts of Kharak multiplayer, live, answer the poll below to let us know your favorite race, and if you enjoyed this piece or found it useful, please comment and/or share on social to show your appreciation. Thanks for reading!